VACAVILLE, CA – Philadelphia Eagles star wide receiver and potent kick return specialist DeSean Jackson spent Thursday delivering words of inspiration to the youth of Vacaville. Jackson, the former Cal-Berkeley standout will hold his inaugural youth football camp at Vacaville Christian High School this weekend and arrived a day early to volunteer his time within the community. Jackson, along with his brother Byron made appearances at Travis Air Force Base spending time with soon to be deployed troops and then spoke to a group of youth football players and their families at the Vacaville Christian High School. Both DeSean and Byron spoke to kids and parents about making good choices and life decisions on and off the field. 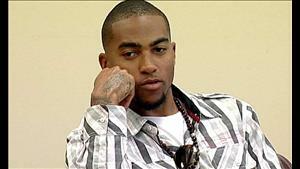 DeSean’s popularity and fame has grown since making it to the NFL in 2008. Now a two-time Pro-Bowler, he realized he can have a huge impact on kids as a role model and calls it “a blessing” to be able to interact with them. Together, DeSean and Byron created a program called Sports Rhythms Athletic Skills Development where they base their message off of five core principles – desire, dream, vision, believe, and power. DeSean credits those values, and the guidance from Byron and his late father, who passed away in 2009, for keeping him away from negative influences growing up in rough neighborhoods in Southern California. The Jackson brothers will spread their message and also work with youth football players in grades 3-12 this Saturday and Sunday from 9:00 a.m. to 1:00 p.m. at Vacaville Christian High School. Registration and orientation begins Friday evening at 6:00 p.m. and slots still remain available. This upcoming weekend of June 10-12, 2011, DeSean Jackson and his older brother Byron Jackson will be bringing the SportsRhythms Athletic Development Camp to Vacaville Christian Schools in Vacaville, California. DeSean, who played at the University of California and currently plays with the Philadelphia Eagles, and his brother Byron, who played football at San Jose State and with the Kansas City Chiefs, are holding this camp to help kids with the proper skills that are needed to help them both mentally and physically when it comes to playing in the NFL. The Jacksons have five aspects on life that they live by and apply to the program as it has been a key element to both of their stories of success when it comes to making it to the NFL. The five aspects to the program are: Desire, Dreams, Vision, Belief and Power. Campers attending this weekend’s camp will be instilled with the five points as the Jacksons hope that they leave with the motivation to let it help them with their everyday lives and not just with football. DeSean and Byron will be speaking about their journey in life to make it to the NFL on Thursday, June 9, 2011. This session will be free of charge and anyone from the community who would like to attend is welcome to come out and listen to the brothers speak. Aside from attending the University of California, DeSean was born and raised in California which is why he is constantly giving back to the communities of both California and Pennsylvania. Byron, who wasn’t as successful as DeSean currently is when he had his stint in the NFL, has been documenting DeSean for his entire life as he’s been on the same route that his brother was on to make it to the NFL. He currently has the DeSean Jackson Project in the works; a documentary film that shows the life of someone with the determination to beat all the odds and to become one of the greatest players in the NFL. As the only player in NFL history to be named to the Pro Bowl at two different positions – wide receiver and kick returner on special teams in 2009 – DeSean Jackson is on the right track. It’s not going to take a Super Bowl for people to finally realize how good DeSean Jackson really is or how far he’s made it in life. 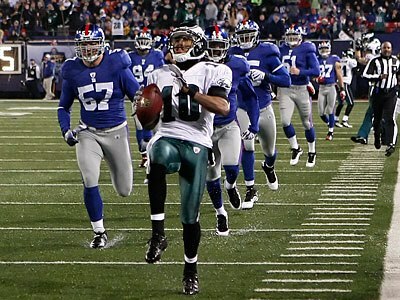 When he was selected by the Philadelphia Eagles 49th overall in the second round of the 2008 NFL Draft, it was one of the first odds that DeSean Jackson beat. Now, he has the entire world as his stage to show all the doubters in life that hard work, faith and determination pays off down the line. For someone who was told his entire life that he was too small to play football, he’s become one of the biggest players in the entire NFL.